Thank you to the Eater LA staff and friends who mentioned us a few times in this list of “Top Standbys.” You can see the full feature at this link on their website or read below. Friends of Eater, and Eater staff, discuss their regular spots around town. Milo & Olive, Gjusta, Zo, Petit Trois, Bestia, Jon & Vinny’s, Eveleigh, Dean Sin World. Per usual, my standbys are local: the people at both Robata Jinya and the Sugarfish on La Brea should know me by name at this point. Kinjiro — the only place to get “cheap” bottles of $950 Dassai “Beyond”, served by your local A5-12 Wagyu purveyor. CUT, Park’s BBQ, Angelini Osteria, chi SPACCA, Union, Animal, Sticky Rice inside GCM (if we’re counting stands), and for always having a soft spot in my heart: Honda Ya. Even with all the well-deserved accolades, the staff at Terrine never rested on their laurels, everyone from chef Kris Morningstar to bar man Ryan Wainwright along with Stephane Bombet and Francois Renaud kept raising the bar on themselves by keeping things exciting all through 2015. The brunch menu is ridiculously good with French standards like croque-madame that blows even a Parisian version out of the water. The escargot at dinner is superb, and the fish & chips are always a good bet. For my frequent dim sum fix, China Red in Arcadia is still the place for made-to-order diminutive dumpling delights. The steamer tins are always filled with perfect har gow and siu mai, and the price is competitive with the SGV. 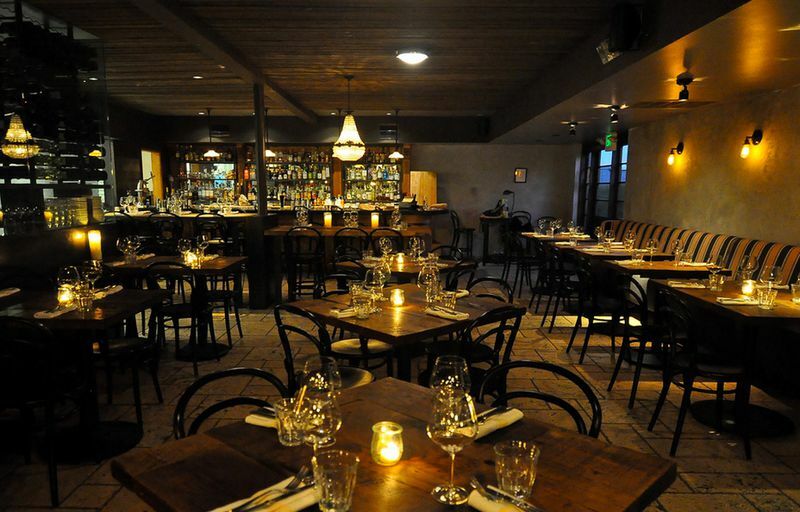 It’s also easy to forget an L.A. fixture like Chaya. Although Chaya Brasserie closed at the end of 2014, the Venice and DTLA locations still manage to stay inventive with plates like live uni and dashi jelly during Chaya’s Uni Fare menu. DTLA’s Chaya also freshened things up this year with the Kaisen Bar by serving whole fish in raw and cooked forms. Other than my local Thai delivery spot, I found myself at only a few restaurants more than once. chi Spacca, even for drop-in focaccia del recco and some salumi; The Grand Central market, which usually meant Wexler’s, Tomas y Tumbras carnitas tacos, McConnell’s ice cream and Horse Thief barbecue, although I did mix in some oysters and coffee and cookies, when possible; and if I could go more than I do, I’d probably be at Republique every week. Terrine, Sotto, Corner Door, Cassell’s. A busy travel schedule, and many work related meals, limits my chances of frequenting any restaurant. But whether I was entertaining out of town guests, having an evening free to eat whatever I wanted with friends and family or referring someone to a great restaurant, I counted on Coni’Seafood, Bestia, Cassia, the Hungry Cat (my neighborhood spot), the Mercado Olympic,Guerrilla Tacos and Tacos Quetzacoatl in 2015. Night + Market always… Kobawoo, Escala, Cadet, Petty Cash, Tatsu, Stir Market, Jitlada, Chaya, Bay Cities, Gracias Madre, hanging out at Grand Central Market & anytime I’m craving uni – I thank god that Maruhide exists. Ledlow: great brunch and one of the best croissants in L.A.
Sun Nong Dan in Koreatown, Sotto (still the best pizza in L.A.), and Sugarfish, my weekly sushi spot. -Pine & Crane. I’m not sure how I survived without them. All’Acqua. I’m there once a week at least as it’s in my hood and they treat my toddler like royalty. Sweetgreen – on the days after a big meal, when I can only stomach lettuce, these salads really are leagues better than everyone else’s. include Cassia, Gjusta, and Taste of Tehran. I just moved to LA in August and have traveled a bunch since, so my standby list is still shaking out. That said: Guerrilla Tacos at Cognoscenti Coffee every Wednesday is a gift, and Father’s Office in the Helms complex is the perfect combination of eating, drinking, and atmosphere in our neck of the woods. I have also been to BS Taqueria four times since moving here, and I can’t wait to go back. I wrote about this here, but Phorage, Jun Won, Chengdu Taste, Night + Market, The Corner Door, B.S. Taqueria, Apple Pan, Tacos Tamix, and Tsujita.